SureStay Plus Hotel by Best Western Sukhumvit 2 is a modern midscale hotel conveniently located in downtown Bangkok. Open its door in October 2017, this new hotel has become Best Western Hotels & Resorts’ first SureStay hotel in Asia. Located in the very heart of the Thai capital, within walking distance of the city’s main business and entertainment districts, SureStay Plus Sukhumvit 2 will feature 85 comfortable, contemporary rooms and all guests will be offered in-room Wi-Fi. 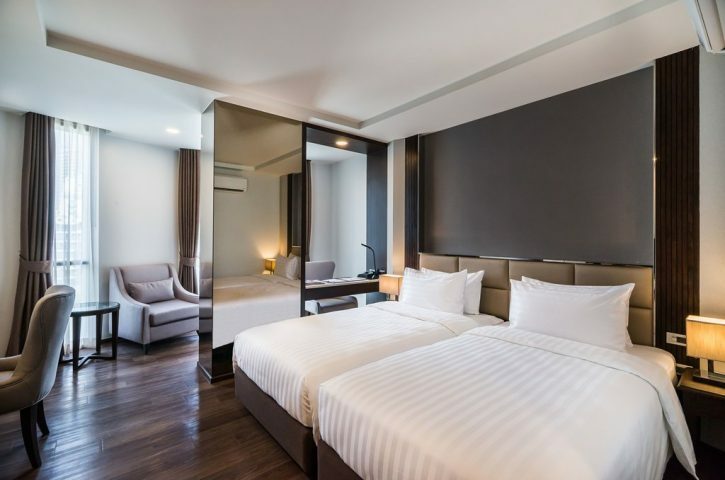 SureStay Plus Hotel by Best Western Sukhumvit 2 features 85 comfortable, contemporary and well-connected rooms in the heart of the city. The 28 Superior and 57 Deluxe Rooms all come equipped high-tech amenities such as free Wi-Fi and flat-screen TVs with satellite channels, plus an in-room safe, hair-dryer, bathrobes, slippers and toiletries. Guests are also offered complimentary bottled water, tea and coffee. "Each SureStaysm branded hotels is independently owned and operateed &COPY; 2016 – 2019 SureStaysm All rights reserved.